Wieland, F. 2013. The phylogenetic system of Mantodea (Insecta: Dictyoptera). – Species, Phylogeny & Evolution 3,1: 3-222. Praying mantises (Mantodea) are a charismatic group of raptorial insects. Their main distribution encompasses the tropical and subtropical regions of the world where they have conquered almost every habitat including the sandy deserts. Mantodea are well-known to the public. Their highly moveable heads and an impressive appearance, ranging from conspicuously colourful to well-camouflaged and plant-like, add to their popularity. Despite their often fantastic looks and interesting behaviour, Mantodea have been mostly neglected by science in the past century. A renaissance of praying mantis research by both molecular and morphological means has recently started to contribute immensely to our understanding of these fascinating insects and their evolution. 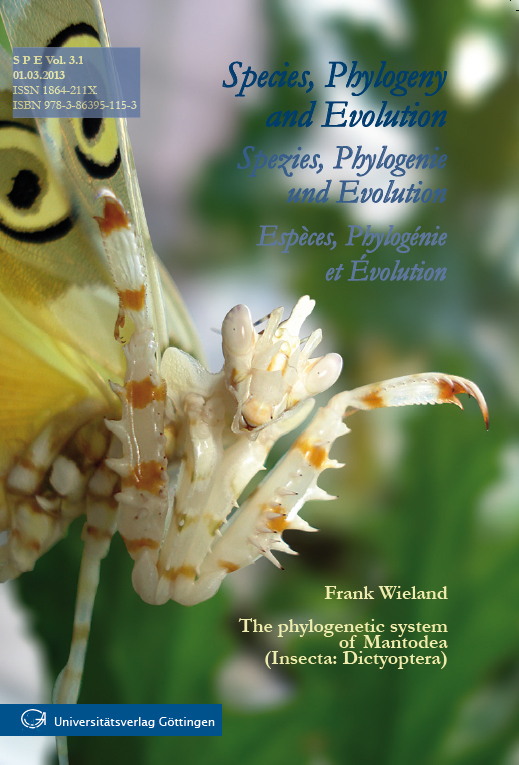 This volume presents the first phylogenetic analysis of Mantodea based exclusively on an extensive morphological dataset comprising the description and detailed discussion of 152 morphological characters for 122 species from the greater part of the taxonomical subgroups. Observations on fossil mantises, postembryonic development, and sexual dimorphism are considered for tracing character evolution, and the results are compared with the latest molecular findings. The structures of many rare taxa are shown in detail for the first time, including the forelegs of Chaeteessa, Mantoida, and Metallyticus. Selected characters and their evolution are elucidated in further detail, for example head processes, asymmetrical male antennomeres, female digging structures, and the aberrant foreleg morphology of Chaeteessa and Metallyticus. Hypotheses on the early evolution of the mantodean lifestyle are presented. This monograph contains more than 460 figures, including detailed drawings and SEM images of morphological structures, making this volume the most comprehensive work on mantodean morphology to date. How does one get to actually see the article?